Easy2Boot is a set of grub4dos files which can be used to make a grub4dos bootable (multiboot) USB Flash drive (or USB hard drive - read below for more details about Easy2Boot USB HDDs). By simply copying bootable ISOs and images to the Easy2Boot USB Flash drive you can then boot from the USB drive and boot directly from those ISOs or images. No menu editing or other fiddling about required. No special s/w needed. Just copy your payload files and go! Watch the YouTube video below. It even shows how to boot directly from linux ISO files with persistence! E2B is easy to maintain, just delete any payload file you no longer want. Since the menu will build itself when you boot, you don't need to worry about editing any menu files. It is also easy to update to the latest version (just takes a few seconds), so no need to re-make your E2B USB drive to get the latest version. Easy2Boot should work with 99% of all linux ISOs (even those that need cheat codes or don't have any cheat codes for ISO booting and so could not be booted by grub4dos before Easy2Boot!) 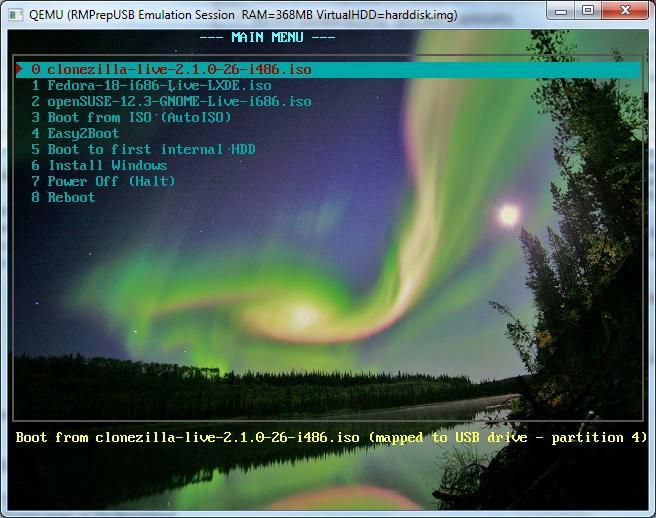 and many other live CD images such as BartPE, Win7PE, WIn8PE, Hirens, UBCD4Win, UBCD, Plop!, memdisk, etc. etc. . Also, works with XP and later Windows install ISOs too. Apart from Windows ISO files, the action taken is based on the file extension. For instance, a Hirens ISO will boot more successfully if you rename the extension to .isowinvH. You can also add a .mnu file for the more difficult ISOs/images (sample .mnu files are included in the \docs folder of the download and more can be downloaded from the Easy2Boot Tutorial page - each file contains instructions). More information can be found on the E2B website. Easy2Boot does not care about the version or name of the linux ISOs (unless you use a .mnu file) and so will work with linux ISOs that come out in the future. Easy2Boot is designed for a USB Flash drive. You can use Easy2Boot V1 from a USB hard disk too (FAT32 or NTFS), but to use the Windows Install ISOs, you also need to plug in a USB flash drive which contains two small files in the root of the drive - see the web page for more info. Standard MS Windows Install ISOs can currently be added to an Easy2Boot USB flash drive and they should automatically work (as long as the filename is correct): See HERE for a list of Windows ISOs that should 'just work'. You can have 16 or more Windows install ISOs on the same USB drive and they will all work. If you always want to use the same Win 8/SVR2012 Product Keys, you can edit the appropriate grub4dos menu in the \grub folder to add in your Product Keys. Your Windows Install ISOs should be placed in the \_ISO\Windows folder and have specific names (although the user can pick from any number of different ISOs in the Win7/SVR2K8/SVR2012 folders) - it should be obvious where each one goes and what to name them. Latest versions support direct booting of VHD and WIM files, UEFI booting from .imgPTN files (Secure boot supported), exFAT, FAT32 and NTFS formats, animation, large fonts, menu designer, boot from multiple linux ISOs with persistence, multiple WindowsToGo payloads and much more. This is one of the coolest things I've run across in a long time. You guys have GOT to check this out. BTW: I have been using this on both a flash AND a USB HDD, both are NTFS formatted too. I have not done any OS installs yet I just use it to launch various ISOs, so maybe those are effected by the prerequisites. Windows Vista/7/8 install won't work from a USB HDD because the Autounattend.xml is only picked up by WinPE on a 'removable' drive and USB HDDs are 'fixed disks'. So you will get a 'need a CD driver' error message when it boots as it won't find the source files on a 'DVD'. I think NTFS Flash drives should work as long as you keep the .xml files and isoname.cmd file well over 2K long - grub4dos cannot write to files < 1k on NTFS! 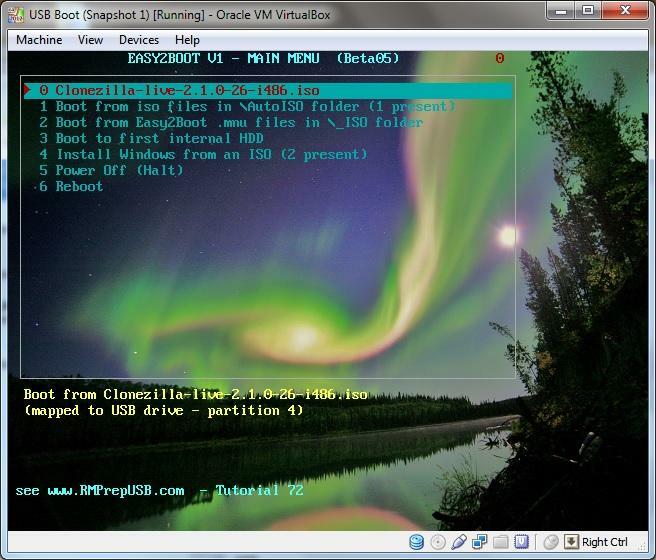 [Edit]E2B now works with Windows files on a USB HDD - just convert the ISO file to a .imgPTN file using the MPI Tool Kit. Edited by steve6375, 16 November 2016 - 12:48 PM. This version does not list the Windows Install and AUTOISO menu entries in the main menu unless you actually put some ISO files in those folders. It also counts the ISO files in each Windows folder (see screenshot) and does not list ones that are empty. grub4dos cannot write to files < 1k on NTFS! I would say that NTFS stores small files "differently" from "normal" files (by saving them completely within the correspondent $MFT entry) and thus such files cannot be accessed in the same way, consequently I suspect that a number of utilities, including grub4dos may not be able to manage them correctly. I cannot find an "authoritative" source for the exact size where this "switch" happens. Files less than 900 bytes or so are stored with the directory entry in the MFT. Small files and folders (typically, 900 bytes or smaller) are entirely contained within the file’s MFT record. Small files and directories (typically 1,500 bytes or smaller) are entirely contained within the file's MFT record. My small tests lead me to believe that the "limit" is at 720 bytes. It is purely a grub4dos problem. A simlar issue exists with the blocklist command - I made the 'limit' about 680 bytes - see here. It may depend on what attributes the file has as I think this adds 'records' to the start of the file. If you edit the file, then extra attributes are added and the data has to be moved to a new sector as the extra attributes will overwrite the start of the original data. drat! Seems no matter how much I test it, I always miss something! Try version BETA04a - two files have changed. P.S. The main menu does the counting, so if you change the contents, you must go back to the main menu so it can recount the files. BETA04a - now works. Very cool. nice job , i have a question to ask , you said it ll work on fat32 flash only , so we cant copy >4GB iso on the flash, is it possible that the iso can be put on internal HDD ? it should work with ntfs ... Just not fully tested. Windows Vista and later installs will not work from a hard disk unless the ISOs are modified. See Tut 43 for details. The user can make his/her own menu changes by making his own \grub\mymenu.lst file (which is copied from the menu.lst file and then edited slightly). The user can then change mymenu.lst to change the colours, menu position and size, menu heading, bottom cyan text or re-order the menu items to list ISO files last rather than first. Well, the issue you posted a link to is still connected to the way NTFS work, as I see it. So, as soon as a file "$MFT contained" grows above 720 bytes it is "promoted" to "normal file" and assigned a Cluster, but when a file is shrinked it is NOT "demoted" to "$MFT contained". Myfragmenter (which can be seen as a NT correspondent to the grub4dos blocklist command) finds NO clusters for the file until the file grows and is thus automatically "promoted" to the rank of "normal file" and as such is assigned a cluster in the filesystem outsiide the $MFT. Not sure what you are trying to point out? Each $MFT file entry has a file record segment header followed by a number of attribute record headers (see here). Now your XP may create a new file with certain attributes, but another XP (maybe with compression enabled or journalling/versioning, enabling/disabling 8.3 filename, or some such) may well add more attributes or even just create new copies and mark the old version as 'deleted'. Win 7 may well be different again to XP. Which is why MS is vague about the exact number of bytes available for data. I think that if any sort of action is done to a file (like write, resize, etc. ), extra attributes need to be added and so it has to create a new cluster and put the extra attributes in the $MFT record (or maybe write an attribute list entry to point to a new attribute list)?? Anyway, the point is that the grub4dos routines that access the NTFS filesystem cannot cope with writes to a 'self-contained $MFT small file' because presumably it is too complicated! It would need to allocate a new cluster and munge the data in the $mft, create a new atribute list, etc. etc. whereas if the file is already using clusters, it can simply amend the cluster list (and hopefully the $bitmap) and write the new data to the new clusters (if it is longer than before). Actually scratch that - grub4dos cannot extend a file anyway, it can only 'dd' within it - so I am not sure why it can't do it - maybe for the same reason that blocklist fails - i.e. it cannot ascertain which sector(s) to modify??? Only that the issue is not "limited" to grub4dos, the myfragmenter tool has the same difficulties. About MS, it is not only being "vague", it is simply "contadictory" and "wrong", the referenced articles were written for the new NTFS in Windows 2000 (the one stating 1,500 butes) and about 2003 (the one stating 900 bytes)! I do understand that different filesystem attributes may slightly change the size, but it can never be around 1,500 bytes, and not even 900 bytes. I presume that the reason tinybit proposed in the reference you gave (grub4dos not being able to accept files not starting on the beginning of a sector -or possibly of a cluster) may be common to other tools, if they do "direct access" and use not NT API's or whatever MS inbuilt "providers/interpreters/whatever". It would be interesting to see how the good Linux guys manage the thing in the NTFS driver and how the same is solved (or is not so ) in ntfs4dos and the like. gives a file size of 738 bytes??? well echo. gives two characters cr and lf - so the file will always be an even number of bytes - so both are correct and 737 is probably more correct, meaning max file size is 736 for $MFT file. Yes , and since the "other way" set the limit to 720, the difference is a "nice, round" 16 bytes. I will do more experiments to find out how much this limit is variable using different file creating approaches. sets the limit at a "new" 728. seemingly halfway between the 720 and 736 found till now. again sets it to 736, no matter if the big.txt file is full of 00's or filled with data. 1. /menu.lst file now re-instated - it calls /grub/menu.lst. If there is no /menu.lst file then grub4dos displays a black&white default menu for a short while which looked naff! 2. /grub/menu.lst now has all user settings at the top. Copy this file to /grub/mymenu.lst and then edit the settings. More settings are configurable now. 3. To add your own wallpaper, just add a /grub/MyBackground.bmp file - make sure it is exactly 640x480 or 800x600 and 24 bit colour. If any problems, edit your mymenu.lst to set the correct graphics mode. 4. bugfix in addisostomainmenu.g4b - it blew down below the /mainmenu folder and added extra isos to the menu! 5. patchme - this is a grub4dos batch file which will patch grub4dos on your USB stick to remove those pesky signon/debug messages. Instructions are in readme in the download. Is not as easy as Easy2Boot topic says. Its not easy to find download links. At first i just copied all contents from the easy2boot compressed file to the USB and copied some windows ISos. Tried to boot and nothing. So not as easy as that. Reading another thread. It seems you need rmprepusb - RMPrepUSB_Full_V2.1.659.zip to get started and prepare the USB to use the Easy2Boot files. Based of the video Tutorial on this other thread. Need easy steps to follow. The docs dont give easy steps to follow. At first I was looking for a tutorial to follow on the files included but didnt find one. Then came back to this topic and read the last post and read to look in doc folder but the info doesnt cover to set up USB stick. You first need to have a grub4dos bootable USB Flash drive. To make one, see the RMPrepUSB Tutorial 72 - Easy2Boot. There is also a YouTube video too! 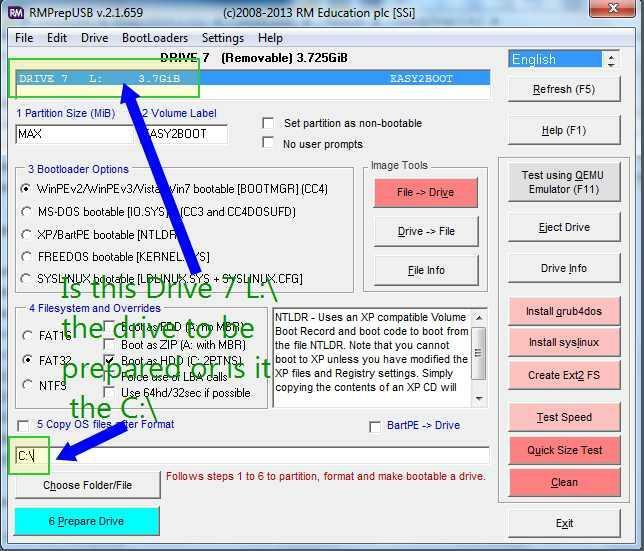 Im seeing C partition being selected in RMprep as you can see in the above post. Can you edit youre first post and add easy links to download files with the steps you mention. Box 5 says 'Copy OS files after format' if you look the box is not ticked, therefore it won't copy the files from C: - it does not therefore matter what is in the 'Folder/File' box. Thanks. Just wanted to make sure. Will be testing and posting if any problems.